Theysohn Extrusion, consisting of the companies Theysohn, Technoplast, Topf and Extruder-Komponenten Salzgitter, is an “all-in-one” provider which has developed a unique series of extrusion lines, tools and pipe heads. Theysohn always turned its attention specially to the continuously development of the extruder control system TEC 4s. One year ago Theysohn presented the new TEC 4s with simplified handling and retrokit for existing extruders, now the next stage of development has been reached – Failure Remote Diagnosis via Internet. At the extruder screen a failure is displayed and the production stops. It may take hours to interpret and to solve the problem. In this situation you tend to ask for a Theysohn expert, who can solve the failure as quick as possible. But not always a Service-Team at customers site is necessary, to clear the fault. 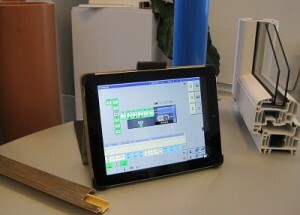 In many cases it would be faster, cheaper and more effective when the Theysohn service experts connect themselves to the extruder control via remote access. They can read all production datas, identify possible faults and start appropriate measures. In most of the cases this can be done directly – means online. This quick and secure failure diagnosis reduces downtime of the extrusion line and increases the availibility and hence the productivity. A service expert from Theysohn supports you via internet and telephone with fault finding and clearing. Thus downtime of the extrusionline will be considerably reduced. The service technician will answer via telephone at once or will send an answer within reasonable time. You do not need to worry about invoicing of the support as a support package will be negotiated in advance. You will be informed continuously about the incoming support time and so the spended hours are shown clearly.